An Alberta clipper will move through the region on Tuesday, ushering in a blast of frigid Arctic air. Warm weather continues in Winnipeg today and tomorrow with daytime highs in the low minus single digits. The city will see some sunshine today, but cloudy skies will return for Tuesday as an Alberta clipper moves through the province. This system will bring a major change in the overall weather pattern over western Canada and usher in an outbreak of potent Arctic air. The city will see a chance of some light snow tonight and Tuesday as the low moves by followed by a strong cold front. Amounts are forecast to remain light with the accumulating snow remaining further north across central portions of the province. Winds will be light today the pick up out of the south into the 20 to 30 km/h range tonight. 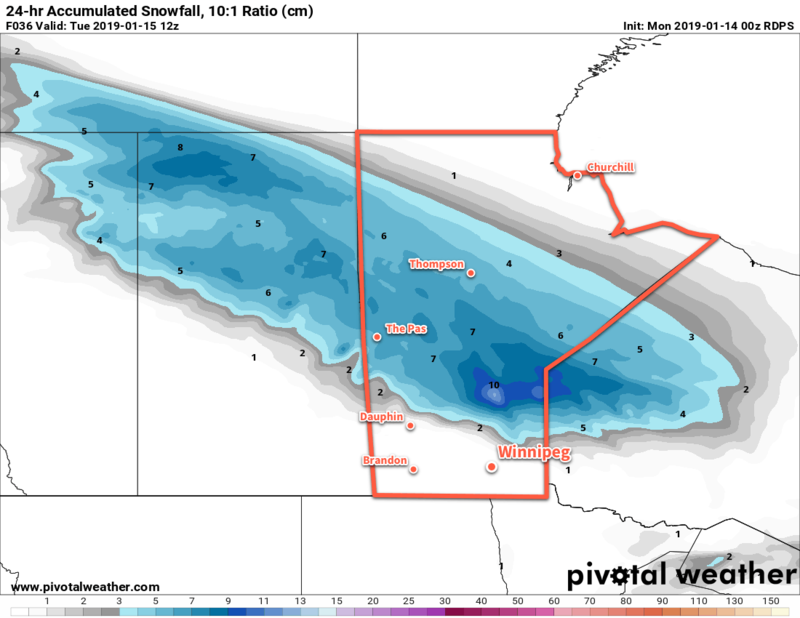 The snowfall associated with the Alberta clipper will fall mainly through northern Saskatchewan and central Manitoba. A potent cold front will sweep through the Red River Valley early Tuesday morning, ushering in strong northerly winds of 40 gusting 60 km/h. These winds will bring colder air in through the day, resulting in temperatures falling to around -18°C by the evening. The winds will ease late in the day as the Arctic ridge builds into the region. Temperatures will fall to a low near -29°C on Tuesday night with clearing skies. Temperatures will be near 10°C below seasonal in Winnipeg on Wednesday. Wednesday will bring a few clouds and cold temperatures to Winnipeg. Winds will remain light with temperatures recovering to a seasonably cold -20°C. Temperatures are a bit tricky for Wednesday night; if the city continues to see variable cloudiness, temperatures will remain in the -20 to -25°C range. If skies clear, though, it could be another night with a low near -30°C. The remainder of the week will be cold with highs in the low minus teens or minus 20s and overnight lows near -30°C. Winnipeg will see plenty of sunshine through the latter half of the week. Brrrr. Winnipeg’s seasonal daytime high is currently °C while the seasonal overnight low is °C.